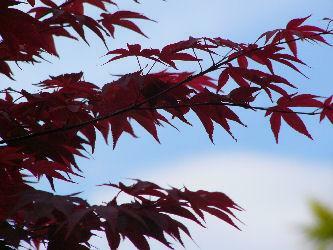 Japanese maples can be identified by their lacy foliage. Japanese maple tree care begins with careful attention to the planting location, soil and watering conditions. These exquisite trees may grace the landscape for many years to come, and with proper care, Japanese maples can grow into your favorite landscape accent. Among the many types of maple trees you can buy, Japanese maples are some of the most pleasing and beautiful and are great for smaller gardens. Japanese maple trees (Acer palmatum) are actually native to Japan, China and Korea, and have been enjoyed for centuries, cultivated in gardens of exquisite beauty throughout these countries. With over 1,000 cultivars, Japanese maple trees come in an astonishing variety of colors, sizes and types. Most maple trees have five lobes or points on the leaves, but Japanese maples may have five, six or seven. The leaf colors range from a light, delicate green to a rich, dark burgundy, almost purple color. Japanese maple trees stay on the smaller side of the maple tree scale. A typical Japanese maple has many slender trunks, with branches rising from the trunks and forming a natural dome or rounded shape. Trees can be gently pruned but are often quite attractive if left alone. Japanese maple trees are usually very hardy and are seldom plagued by diseases. Follow these basic Japanese maple tree care steps for a healthy, robust tree. Japanese maples thrive in zones 5 through 8. Many grow in the wild as under story trees, tucked underneath larger trees in full to partial shade, but others prefer sun. You can successfully grow Japanese maple trees in full sun to partial shade, but do check with your garden center first to make sure that the variety you like will thrive in your particular light conditions. You can grow Japanese maple trees in the garden or landscape or in containers. Container-grown Japanese maples may be allowed to grow several feet tall, then trimmed to keep them a certain height. Some trees are even grown as bonsai, miniature, perfectly formed trees. Japanese maple trees tolerate a wide variety of soil conditions. They can be grown in clay, sandy loam, and just about anything in between. They don't mind if soil is just slightly acid or alkaline and tend to be forgiving if the soil pH isn't quite right. However, they don't like their roots to be wet all the time, so well drained soil is a must. Before planting your Japanese maple tree, add compost to the soil. Mulch spread over the soil surface helps retain moisture in drought-prone areas. Among the most frequently asked questions about Japanese maple tree care are pruning questions. Most people prefer to trim a few branches off the Japanese maple tree to shape it. A little light pruning each year is better than allowing the tree to grow and then doing a substantial pruning. Experts recommend leaving the tree alone for as long as possible. If you try to prune away too many branches while the tree is young, you may prune away branches that could add beauty to the tree's shape. The skinny new branches of young trees, frequently called buggy whips or whips due to their long, slender shape, should be left alone as much as possible. See how they develop, and if you're still unhappy with the shape, gently prune away a few branches. You can prune Japanese maple trees at any time during the year, but winter provides a unique opportunity. With only the bare branches remaining, it's easier to see which ones need pruning and which ones you should keep. Although Japanese maple trees are very hardy, they can succumb to a variety of insect pests. The most common culprits are aphids. Aphids can be controlled with sprays or organically through the use of prey insects, such as ladybugs. Other diseases that can affect Japanese maple trees include scale. Drought tends to weaken trees and make them more susceptible to insect infestation, so be sure trees are watered during dry periods. With so many wonderful varieties to choose from, there's sure to be a Japanese maple tree for you. And because Japanese maple tree care is so simple, it's easy to understand why this tree is beloved by gardeners worldwide.